Dr. Watson recounts his life prior to his historic first meeting with Sherlock Holmes. Referring to his mother’s family, the Hudsons, Watson states, “Their issue in my time included a gamekeeper with two sons of totally contrasting status. The elder, Donald, was a civil engineer. His brother, Angus, went into domestic service, rising to be a butler well known in the highest strata of London society.” Angus and Donald Hudson are from the British television series Upstairs, Downstairs. Hardwick wrote tie-in novels for that series. Among the members of Watson’s regiment in Afghanistan are Colonel Ripon and his illegitimate son, Will Gale, as well as Captain Fletcher. Ripon, Gale, and Fletcher are from the novel For Name and Fame by G.A. Henty. Several details in this novel conflict with Watson’s CU history, placing it in an AU. Both Watson’s parents are portrayed as Scottish, and he was raised in Scotland, whereas in Farmer’s The Adventure of the Peerless Peer, Watson says that he is of Scots descent on his mother’s side, suggesting that he does not have any on his father’s. His middle name is given as Hudson, whereas in the CU it is Hamish. Watson also has a sexual encounter as a teen with Aggie Brown, a maid at his school. Watson later discovers that this fling resulted in a son named Frank. When one of his fellow medicos tells Watson about Ripon’s relationship to Gale, he describes Gale as Ripon’s “bull pup,” calling it an old family expression. 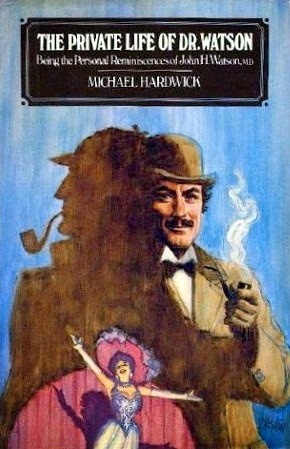 At the end of the novel, Watson begins financially supporting Frank; this explains why Dr. Watson referred to keeping a bull pup in A Study in Scarlet. However, in H. Paul Jeffers’ story “The Adventure of the Old Russian Woman,” which takes place in the CU, it is revealed that Watson was using “keeping a bull pup” as a metaphor for having a temper.